… You get Jinder Mahal’d. Not that there’s anything wrong with Jinder (at JMS, we’ve long advocated for an completely unhindered Jinder) and his United States Championship is a nice acquisition for Raw. 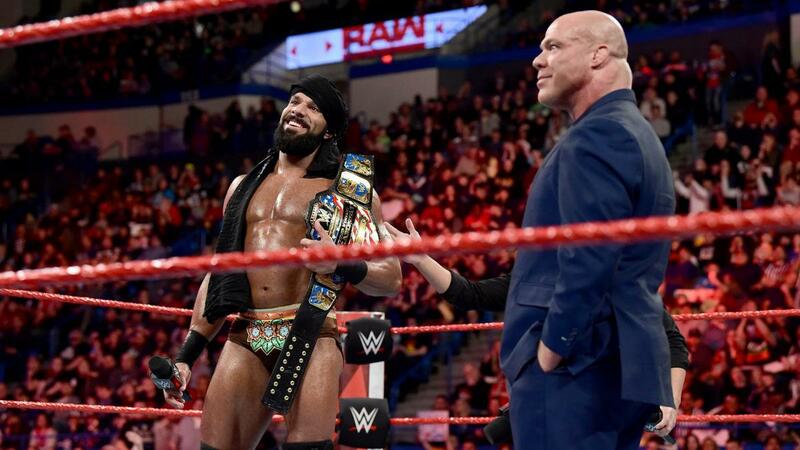 It’s just that they had him lose it so quickly, it appears they may have been using the title as a reason to send over Jinder to Raw, and not because they wanted them as a packaged deal to add value to Mahal’s character. Which seems like a cruel joke even for the WWE. Following the match we learned through implication that going forward Jinder will be spending time with his equally unhindered new co-worker, No Way Jose. Which is actually kind of neat from a screenwriting perspective. It allows them to lean into Jinder’s entitlement and give him a character outside the context of a title via its contrast with Jose’s apparent lack of concern for possessions (or owning shirts that actually button all the way up). Jose just wants to be Jose, while Jinder validates himself through the prism of what he perceived to be inherent dominance over others without realizing much of that comes from his presumed-to-be-inherited status. His Modern-Day Maharaja character has always done things to signal his wealth, but that wealth was a means of allowing him to afford the help (of the Singh brothers and others) to keep his title. By highlighting things like his demands for special treatment because he’s Jinder Mahal in his first promo on the show, then immediately removing the title from him that would at least nominally worthy and still having him expect his demands be met, it attributes to him an actual character motivation that is a manifestation of his character’s established upbringing and status. And as a physical foil, No Way’s free spirit and joie de vivre are placed on equal footing with Jinder’s self-seriousness. Which is not bad for a segment which ends with Renee Young dancing off to samba music.